Why is the PAC Fence better than the rest? The PAC system is tried and trusted and has been on the market since 1989. 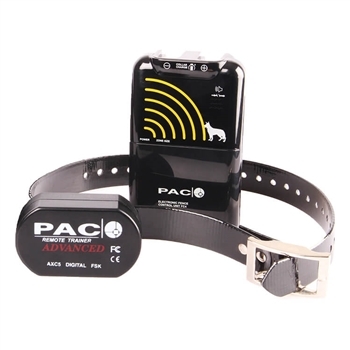 All PAC collars have rechargeable batteries, thereby eliminating the frequent purchase of replacement batteries. The collar is chargeable through the probes, retaining full integrity in dampness and against water ingress. Initially collar needs to be charged every 2 -3 weeks but once the dog is used to the system only needs to be charged every 1 – 3 months depending on usage. As a result, running costs are negligible. System is designed for easy, DIY installation, using low cost, and high-quality wire. The control unit has provision for 2 x 9V batteries to enable an automatic UPS –uninterrupted power supply) facility-up to 8 hours of standby boundary protection-in the event of mains failure. This intelligent feature is fully stabilised to maintain zone size, irrespective of power source. Very safe wire voltage (12v), either powered using the supplied mains adaptor, or, in areas where mains is not available or of inferior quality, by using a car or lorry battery. PAC Fence has the highest top end energy transfer to cater for the most determined escape artist. The energy transfer is consistent in all conditions wet, dry or snow. Other systems on the market can be ineffective in wet or snowy weather. PACs collar is fully waterproof and will withstand wet, muddy conditions as well as falling into a pond, pool or stream. Levels of stimulus are self-imposed by the dog or cat (i.e. levels increase from a beep to a beep with low-medium then high dependent on time in the active zone and proximity to the wire) so no need to manually change levels etc. Speed detector prevents fast run through, so if your pet runs at the wire collar will go straight to maximum level. Control unit will alarm if there is a break in the wire. Digital signal processing gives immunity from outside radio interference. In built lightning protection protects against 95% of local, adjacent lightning strikes.